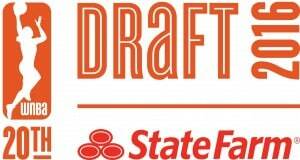 UNCASVILLE, Conn. (April 7, 2016) – WNBA Draft 2016 presented by State Farm will be held on Thursday, April 14 at Mohegan Sun Arena in Uncasville, Conn. ESPN2 will provide coverage and analysis of the first round beginning at 7 p.m. ET, and ESPNU will air coverage of the second and third rounds starting at 8 p.m. ET. The event is open to the public. Sun season ticket holders who have RSVP’d will be admitted free of charge and have access to priority seating. Fans who are not season ticket holders will be admitted with the donation of a canned food item at the door. All donations will benefit the New London Community Meal Center. The Seattle Storm holds the top pick in the draft for the second consecutive year and the fourth time in franchise history after winning the WNBA Draft Lottery presented by State Farm last Sept. 24. The San Antonio Stars will select second, followed by two selections for the Connecticut Sun, which has its own pick at No. 3 and a pick acquired from the Atlanta Dream at No. 4. The fifth pick belongs to the Los Angeles Sparks. For more information on WNBA Draft 2016, visit connecticutsun.com or call 877-SUN-TIXX.